Categories, categories, and more categories! It seems like I am forever talking about categories with my language students either directly through their goals or indirectly for another language concern via the Expanding Expression Tool. I am constantly on the hunt for something to make categorization more fun and interesting for my students. We use store-bought games, sorting manipulative objects, and homemade activities. Each year, I try to challenge myself to find a new way to make something fun for the topic. I think that my students will be pretty pleased with the end result this year. Category cubes! I decided to make these to use on rainy days when I can't take them outside to use my homemade thumball. There are twelve different category cubes in this packet that range from specific (ex. things at school) to random topics (ex. naming things with wheels). 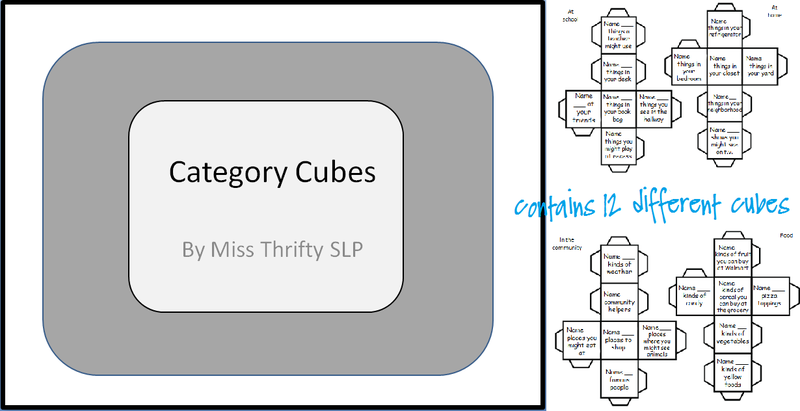 To get your copy of Category Cubes, head on over to my blog by clicking on the picture below.